Hit Ohio's roller coast for thrilling drops and island hops. 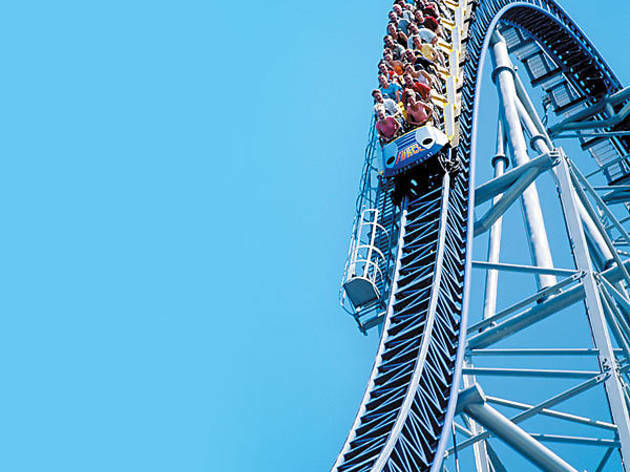 Summer is nearing its last gasp, the rug rats are getting ready for school and most people have started to focus their trip-planning on winter getaways: Perfect time to drive five hours to Sandusky, Ohio, and ride roller coasters in the 364-acre park until you’ve screamed yourself hoarse. Sure, a weekend at an amusement park seems more like a summer activity, but all you have to think about is baking in the hot sun while standing in a two-hour-long line for a 60-second roller-coaster ride to realize hitting Cedar Point in July is for chumps. Located in a longtime resort area on Lake Erie, Cedar Point is the second-oldest amusement park in North America, with its first coaster—a 25-foot-tall, 10mph, uh, yawn machine—opening in 1892. The resort has since grown to encompass a giant water park, Soak City; four hotels; RV campground; two marinas; mini-golf/go-kart area, Challenge Park; and, of course, the main attraction: the 75 rides and 17 roller coasters that have earned Cedar Point the title of “Best Amusement Park in the World” ten years in a row by Amusement Today. Makes Great America in Gurnee seem like a lame carnival, no? It’s a straight shot east on I-90 from Chicago to Cedar Point (One Cedar Point Dr, Sandusky, 419-627-2350; one-day pass $42.95), and as you’re passing through Sandusky on the way to the park, you’ll see plenty of motels and hotels lining the highway. But if you can manage to pay a little more to stay in one of the park’s hotels, you won’t regret it. The Breakers (One Cedar Point Dr, 419-627-2106; rooms $70–$272, suites $170–$1,000/night) is a more than 100-year-old resort that sits on the shores of Lake Erie, sporting a wide, spotless beach with volleyball nets and watercraft rentals. The rooms are nothing spectacular, but for a place to crash after a day of hurtling your body down 300-foot-high drops and stuffing yourself with funnel cake, it’s just fine. Not to mention there are five restaurants in the Breakers (including a Japanese steakhouse and a TGI Friday’s—don’t hate, its margaritas are fabulous on a hot day), and an indoor and outdoor pool, and the entrance to the park is just a two-minute walk—so close you hear the blood-curdling screams as soon as you step outside the hotel. The best part? Stay in any of Cedar Point’s resorts and you get into the park one hour earlier than everyone else—a valuable perk considering lines for the superpopular rides can hover in the hour-long range, even at this time of year. But even on its most crowded days, Cedar Point rarely feels choked with people, and the grounds are lush with towering old trees, flowers and benches. You’ll need those benches for a breather after exiting the more intense coasters, some of which are so frightening you need a brass set of balls to even stand in line. Top Thrill Dragster reaches 120mph in four seconds before climbing straight up a 42-story hill and then careening directly down in what feels like a free fall. The park’s newest coaster, Maverick, hurtles down a 95-degree drop (for those of you scoring at home, that means the coaster falls inward), then hugs impossibly tight curves and loops, races through a dark tunnel and generally scares the crap out of you for the two-minute, 30-second ride. And then there’s the Millennium Force, one of the tallest, fastest roller coasters in the world; the first drop is so steep and long, you have to take a breath midhill in order to continue shrieking. All this howling will make you thirsty for beer. But because Cedar Point markets itself as very family friendly, there are only five places to get booze in the park—and lack of signage makes them difficult to find (hint: look for Game Day Grill and Hurricane Hannah’s). Luckily, food stands and restaurants show up around every corner, serving everything from delicious hand-dipped corn dogs (Happy Friar) to malts and burgers (Johnny Rockets) to cheddar wurst (Last Chance Saloon). For higher-quality fare, walk outside the park (get your hand stamped for re-entry) to the nearby marina for all things ’cue at the chain Famous Dave’s (419-609-2054), where St. Louis–style ribs, Texas brisket and pulled-pork sandwiches are served on metal garbage-can lids. Even the most die-hard coaster enthusiasts crave solid ground for a few hours, so give your body (but not your liver) a break and head to nearby Put-In-Bay, a tiny two-by-four-mile island packed with bars and restaurants. Reachable only by boat (Jet Express, jet-express.com, leaves from Sandusky or Port Clinton), Put-In Bay has a rep for raucous partying (its nickname is the “Key West of the North”). On the main drags of Delaware Avenue and Catawba Avenue, bars are just a drunken stumble from each other, including Mr. Ed’s Bar & Grille (300 Delaware Ave, 419-285-5042), featuring both a rooftop and a poolside, tiki-themed bar; Roundhouse Bar (60 Delaware Ave, 419-285-2323), whose ceiling is draped with a big-top tent; and, a little off the strip, Press House Joe’s Bar (Meechen Road and Catawba Avenue, 419-285-2716), a divey spot in an old red barn. You’ll need to keep the partying a little in check, though; on Saturday nights, the last boat leaves the island at 12:30am. Besides, there’s no room for a hangover during the next day’s dose of caterwauling on coasters, right? 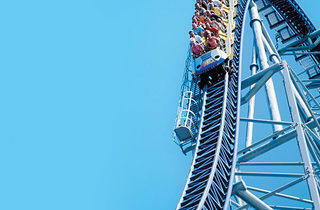 Cedar Point is open every day through Monday, September 1, and Fridays through Sundays through November 2. The park is closed September 5 and 6.